When Q-Games boast about their games, it always seems to be PS3's PixelJunk series hogging the limelight, with almost no mention of their other projects. That's a shame, because with their recent remake of Bit Generations title Art Style: Intersect, and now this, they've already got two great download games on Nintendo's newest handheld. 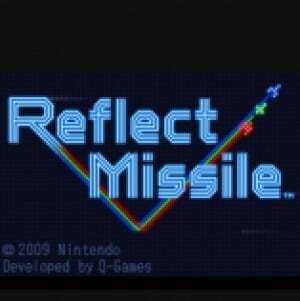 Reflect Missile's name basically says it all. You must fire off missiles in order to destroy certain blocks, which can be achieved by having them reflect off walls. 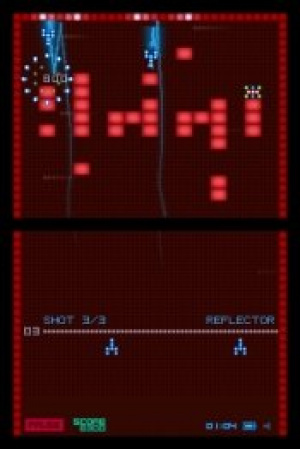 But "Reflector" missiles are actually just one of three types of missiles you can use - the "Driller" missile is able to drill straight through up to seven blocks before disappearing, while the "Bomber" missile will explode on contact with anything, taking out all blocks within a certain radius. Obviously, neither of these two missiles will bounce off walls like the Reflector, meaning you should try to clear a path for them first if you need to. Comparisons to Puzzle Bobble/Bust-A-Move are not misplaced - the gameplay is very similar, with a dotted line showing you part of the trajectory the missiles will take. The blocks you must destroy will also remind you of Arkanoid, another sort of similar game, as they are exactly the same shape. Unlike either of them though, almost no stages have one giant mess of blocks to clear, instead consisting of multiple smaller formations of blocks to allow for a bit more variation and, as expected, layouts which resemble certain objects, such as a clock or playing card suit. At the start, there's a total of 30 stages to test your mettle on, each with a pre-set layout and a different line-up of missiles for you to use. It's not too complicated though, because you're restricted to using the missiles in order, therefore it's just a matter of figuring out the best places to shoot at. Adding some more spice to the mix are some other blocks - bomb blocks act just like a Bomber missile when hit, while item blocks will give your next missile a special ability, such as creating a clone, allowing you to fire two missiles at once! If it was just these 30 stages it would already be a great game, but just before you think there's not a lot to come back to, Q-Games throws a curveball: if you manage to finish a level with missiles remaining, you'll earn a medal. Earn a certain amount of medals and you'll unlock a new difficulty level featuring not 30, but 50 more stages. This happens four times in all, making for a grand total of 200 stages! 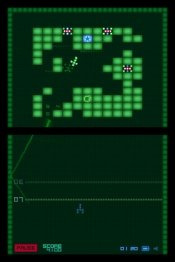 If you don't really have any particular favourite levels and just want to reflect some missiles, there's also a "Quick Play" mode that allows you to pick any of the game's five difficulty levels, after which it will randomly select a bunch for you to play. But, as the game itself says, don't go thinking it'll be easy: stages you haven't cleared yet have a higher chance of being picked than others. As seems to be a popular trend nowadays, Reflect Missile is presented in a very retro-esque manner; all of the graphics look blocky and the chiptune soundtrack is quite catchy. It fits the feel of the game perfectly, and just enhances the already fun gameplay even more. 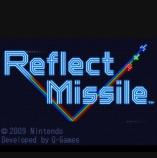 Reflect Missile has got to be one of the simplest names for a videogame ever. To match that, the gameplay is also very easy to learn, but getting medals on all 200 stages will require a bit more thinking, especially in the higher difficulty classes. The game's delightfully retro-esque presentation only helps improve the overall package, and makes this not just one of the best 500 Point games available, but one of the best DSiWare games period. I'll be getting this one the second it hits the NA service. There's a mistake in the review. While it's true that there are 30 stages in the Bronze Class, Silver and Gold Class each have 50 stages, and the two classes after Gold presumably do too, so there are actually around 200 stages. Wow. I will be picking this up! I could do with seeing video footage but this looks like a buy to me. I'm jealous too, I want this game NOW! I absolute agree with the review and the score, Reflect Missile is awesome! 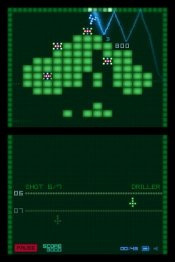 The best missile game since....well, Missile Command! Yes, brilliant game, glad to see it get a positive review. One thing though - the review mentions that it's almost "exactly the same as puzzle bobble" - not really. There's a passing resemblence, but the missiles behave entirely differently to the bubbles in puzzle bobble, and the game isn't time based - so "exactly the same with a few minor differences" is misrepresenting the gameplay. Mmh. . . I think I'll get this instead of pop + solo. Hope it comes out soon. Before Christmas when I get a point card. I think I want a DSi just for this game. Grrrr!!! Why does the DSi keep getting good games?! Stop getting good games G-ddamn it! This looks to easily be at least on par with every other game on the service I have seen. Instant Buy when it hits NA, about time we get a gota have game again on the service. I was not expecting a 9/10.It's going right on my dsiware list. Good. I really hated pop+solo. Don't get it. Get this instead. I should have waited for this. This looks brilliant. If I was going to get a DS, I was leaning towards the Lite due to the GBA playback (can't they have an optional add-on for the DSi? ), but this game would steer me the other way. I love the retro look; reminds me of games from the late 70s. As for this game; couldn't agree with the plaudits more. Cracking download, one of the best ds or wii-ware. I bought this before the review appeared. I couldn't decide between MFC and Reflect Missile, but I chose the latter and I'm glad I did. RM is an amazing game. I like it more than AS: PiCOPiCT. @Blue_Cat: I agree with wii man 10. Pop+ Solo was a huge disappointment in my mind. I downloaded it last month, and really have found no redeeming qualities about it. By wave 4 in "Adventure" mode I was really bored. So it looks like you made a good choice. @Legen Marioid: best chance of my getting a DSi is when I go to Japan next year. I'd probably opt for the "old man" LL for the big screens. I'd really be wanting the kid's Japanese learning kanji software and some downloads. Why the **** are games not released worldwide at the same time? Does it take 2 months to translate it from "british english" to "american english"? Ugh, i was about to go buy this then i saw NOPE YOU HAVE TO WAIT ANOTHER MONTH YOU AMERICAN B****. @ Moochr- I don't think its overpriced, 200 levels, thats a huge amount of levels. YES! I can't wait till Monday........I know I'll be back in school, but Trajectile (this game in America) comes out! Insta buy! Going download this now great review. Gues I'll be getting it. I've only played two levels, and I already think its one of the best games on DSiware! It just hit the DSi Shop today! FINAF***INGLY, I am glad they finally finished translating this from English to English for the past month and released it in the USA. I just got my 500 Points from pre-ordering S&P:SS, so I'll use the points to buy this. There is a mistake. There are 230 levels. 30 plus 50 plus 50 plus 50 plus 50 is 230. I own this game and I counted. Man This review convinced me to buy it. Then I saw the 500 points price point. I'll probably still get it,but wish it was 200. What? Who needs this when you've got lovely AlphaBounce? Wow guess this is a good Club Nintendo option for sure then. @XCWarrior Yeah, can't decide between this and Mario Golf. Also, woah I posted on this article way back when. hmmm....not sure about the club nintendo offer. registering mario kart 7 gave me 50 survey coins, so in other words, you would have to buy 3-4 brand new 3DS retail games, to get enough club nintendo coins.